Sometimes you want to take a break even from things you really love. Before NHK Trophy I found myself completely tired and morally exhausted. ‘What do you know about fatigue?’, athletes can ask me. We train, travel to competitions, compete….And you as a viewer just need to watch and enjoy. But actually it’s not an easy task to get through a six-week marathon, to live every weekend in the new time zone, deal with all working, home and personal issues to have an opportunity to watch it all. Although, if I were a coach, and my athletes performed at each of the six Grand Prix, somewhere near Trophee de France, I would want to send it all to hell and say: ‘I’m going to SPA. Good luck.’ Fortunately, I’m not a coach. The Austrians – it was sad. After all, I haven’t fallen into insanity, last year they looked a lot better, even tried a lutz! What happened? The Germans Vartman – Blomaert also seemed promising last year. The notorious effect of second year? Just don’t show Mari their videos. If she sees how his legs are trembling in lifts, she may not have courage to do them again. Wang – Wang rehabilitated themself for performance in China. Beautiful, harmonious couple, with beautiful programs and beautiful elements … ..they’re good but nothing stands out so you simple can’t remember them. Chen Peng continues to fall on jumps even with a new partner. And why did they put jumps so close to the boards? They have high-quality programs, they’re definately not “made in China”. I like that programs are in different styles, this pair can skate not only lyrical stuff. Yang Jin with a new girl looks a bit differently – there’s something touchingly funny in him. I quite like them. Something was definitely wrong with shooting in Japan. The camera showed everyone in not a complimentary way….everyone except Miyahara…..Girls, this is a conspiracy! Or Satoko lives in a ballet class. Alaine Chartrand were rushing entire short program, ignoring music and qualitative elements. Why she rushed so much? Who was chasing her? In the free program Octavia Alaine skated even worse. The music is beautiful, the program is interesting, but her jumps are completely thoughtless – to jump something and somehow. And the dress adds her extra kilos. I wanted to throw a chocolate bar for Elizabet Tursynbaeva right through the screen a BigMac menu or pizza will be even better. She somehow doesn’t fit the generally accepted belief “girls before puberty can jump everything at any second of the program”. Perhaps, if to feed her, she will jump better? Will have some energy, strengh and so on. Looking at Yura Matsuda‘s dress for the free skate, I think I should be less critical about other Japanese costumes) This dress is just a complete fashion-disaster and should be burned immediately! Karen Chen in the short program decided to join the club of white dresses. New dress didn’t help( But her free program is gorgeous! Karen has a great presence on the ice and she’s a performer! If one day she gets consistancy she’ll be a star. Wakaba Higuchi‘s short program continues to seem like a bad choice for that skater. It doesn’t emphasize her strengths – speed, energy, power skating. Quite another story in the free skating: a powerful and very bright music suits her style of skating a lot, suits her jumps. Surprise, but fact – the blinding eye richness of her costume looks quite ok to me. Maria Sotskova is a refined beauty, but I had to join those who see Adelina in her short program. Especially on the steps sequence. Unfortunately, Maria lacks speed, power and expression of sotnikova. The free program is more individual and suits her better. Strange Japanese camera created an impression that most of the program Masha was looking down at her feet and a wake-up call…..underrotations…..if she already has underrototions, what will be next….. Whether it’s acclimatization, or fatigue, but in Japan Anna Pogorilaya didn’t shine as bright as at Rostelecom cup. It was evident that Anna was nervous … ..and when Anna is nervous she forgets to pay attention to her arms, to stretch her legs….that’s why this time I didn’t have a desire to say “Ah, how Pogorilaya improved in skating!” Of course, undoubtedly she’s first. Well done! But in the Final you need to skate better. Jason Brown‘s quad turns out only on American land ice. It’s a pity because this season I love absolutely everything about Jason! His programs and even his costumes. Simple elegant costumes suit him a lot! 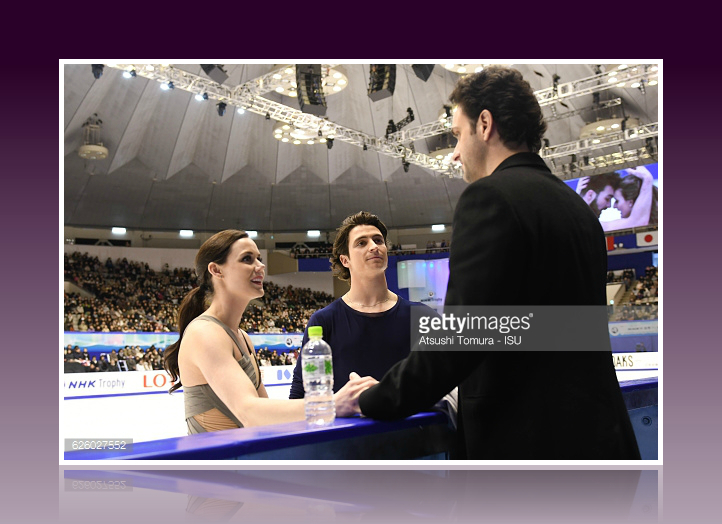 So, Jason, please skate well at US Nationals, I keep my fingers crossed for you! Deniss Vasiljevs‘s free program even without quad was one of the brightest moments of men’s event at NHK Trophy. He was fighting and did everything he could. Stephane and his student it’s such a sweet picture! My heart melt on their “We did it’. To my complete surprise Mikhail Kolyada tried a quad lutz. There were a lot of talks that with such height on a triple he should try a quad. But talks are talks and actually to try it is a complete different thing. Well done that tried – anyway he had nothing to lose. If Salchow doesn’t turn out, it’s necessary to look for other options. But I think it’s better to look for these options at trainings and various b-competitions, because I want to see Misha minimum at European Championships, so he need to skate well at the Russian Nationals. And if I were his coach I’d go with one quad in the short and one in the free program. It’s unfortunate that Alexei Bychenko failed to take the bronze. After all, as it turned out, it was real. Alexei, don’t get discouraged and prepare for the European Championships. The home ice can do miracles. At Rostelecom cup Keiji Tanaka seemed to me so unpresentable and quite boring. But at NHK he was able to get bronze and I even saw some charisma in his skating! Historically, Yuzuru performs amazingly at the home Grand prix. So, you can just relax and enjoy his performances. 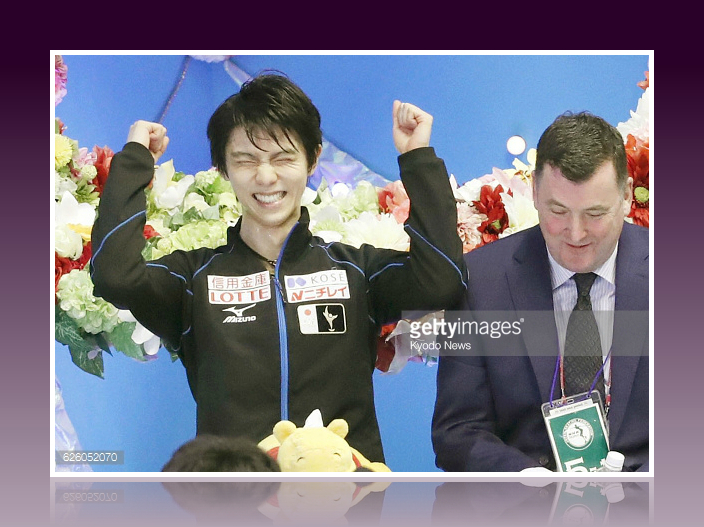 For a clean quadruple loop I will control myself … ..I will be silent … ..Oh no, sorry Yuzuru, you’re cool, your performance was cool but your lavender costume just killing me) Historically, Yuzuru also skates amazingly at the GPF, so, can we just relax and wait for the record? I continue to demand to bring a stylist for the French Marie-Jade and Romain and to burn their costumes to FD just right now. They’re an interesting pair, with interesting elements. Though you’re expect either throw or twist from them … and her short dresses only reinforces this impression! And they also deserve a more interesting dances. I didn’t expect miracle from Sinitsina – Katsalapov in Japan (plus Japan is an unfortunate Grand-prix for them). But losing to US 4-5th pair it’s more than just a bad result( I’d like to ask fans of this pair, what do you do during their twizzles? I mean, do you close your eyes? Drink cognac? Vodka? I’m not mocking. I try to learn from other’s experience, because I also have favorite skaters with problematic elements. I also liked their FD in Japan more than in China, but the dance still lacks some sparkle and fire …Maybe Victoria should really hit him during a “fight” in the middle of their dance? Well, do what you want, but you need to turn on and somehow turn on your partner. I like Hawayek – Baker since they were juniors. But the last few years I had a feeling that Krylova didn’t have time for them. When Kaitlin and Jean-Luc suddenly become a first pair for their coach things seem to go much better. I like both of their dances. I like that they are so different. Their SD is one of the few hip-hop that really looks great. The secret of their FD is simple – this style suits them a lot and classical music brings it onto the next level. Most of Anna Cappellini‘s dresses I marked as “I want it in my closet” and the polka dot dress is not an exception – so charming, as well as their short dance. I don’t want to talk about the scores and judging … .I’m very glad that Anna and Luca skated last and closed the whole GP series. It was a great demonstration that ice dance can be different, that not all dances should be in this fashionable lyrical cantilena style. It was a bright ending and a well-deserved standing ovation! There is something terribly wrong in the fact that we will not see them in the Final. If actual skating, dancing and skating skills are still mean something in ice dance, than Gabriella and Guillaume just had to lose the SD to Tessa and Scott. I had doubts about who should win the free dance. But the French were nervous … .This was evident. I think only now came a recognition of the fact that they train with their main rivals … ..on one ice … .every day … with the same coaches…..and it’s tough. They didn’t have such an experience. But the Grand Prix Final will be in France, so I wouldn’t be so nervous. Tessa and Scott regained the world record in the short dance. For my taste, this record must belong to their Olympic SD, but still there is some kind of higher justice…. I may not like their costumes, Scott’s hairstyle … … but when they dance like this (I don’t even want to say skate, because they’re real dancers on ice) who cares about costumes and hairstyles! I can lose my mind of their step sequence, they do elements as one person….I even can reconcile with the style of their FD...but I’d gladly remove the vocals from the second part. Yet, they always had something special … .. I congratulate us all, we somehow survived this marathon! It’s necessary to have a rest …… necessary to clear your head, to take a little break from figure skating to fully experience the range of emotions from the Grand Prix Final! As far as your note on the withdrawals, I REALLY missed Stolbova and Klimov too. I would be scared of Blommaert trying to hold me up while he’s shaking too! Pair girls are crazy! I love Kayne and O’Shea, but I agree the costumes need to go. I wouldn’t mind if they kept the program (with a few small changes), but once again, the costume designer belongs in Siberia. Wang and Wang just don’t have anything remarkable to talk about. I really think they medal just because no one else skates. Duhamel and Radford were pretty sloppy this weekend, and I think it’s because they didn’t think they were facing off against strong enough competition. I think pairs is in a little slump right now with both Stolbova/Klimov and Sui/Han gone (don’t tell Aliona that I miss the others!) and I think Meagan and Eric don’t have the need to skate strongly. Or at least that’s what my friend figured out. Oh my gosh, Meagan’s commentaries all the way to the kiss and cry are just SO funny. She’s so chatty! I have a feeling that it would be fun to spend Christmas morning with her. Satoko always looks like a jewel. Alaine was just really rough. She tends to look so nervous on the ice, and when skaters are nervous, sometimes they rush through the whole program. Elizabet really does need to eat. When I saw her in person, it was weird because I’m younger than her but I felt like I was looking at a little kid! I think the jumping trouble might be because Brian Orser has taught her the big senior jumping technique instead of the Satoko hop technique, you know? I think in time it will be easier for her, because she won’t have to re-learn her jump technique. I really think she’s one skater where puberty would actually do her some good…while watching her I’m afraid she’ll snap in half. I really didn’t like Yura’s costume either. I have loved Karen Chen ever since she won bronze at Nationals in January 2015, and after that I wondered when she was going to hit her jumps. I absolutely adored her free program last year; in person it was even more beautiful. Her Kerrigan/Kwan spiral is just breathtaking. I hope she can land her jumps again, because right now she’s looking better than half the American ladies. I love Wakaba as Scheherazade. Usually I don’t like all the fixings on the costumes either, but I love her red dress. I agree that the short program doesn’t really suit her. The free was surprisingly good to me – usually when I hear Scheherazade I roll my eyes and prepare to watch “another boring Scheherazade” but this one was actually not bad. Satoko looks so beautiful in the short program. The dress looks like it could be made of ice crystals. I was quite surprised with the fall – I was like, “First Medvedeva falls in France, now Satoko in Japan? I don’t believe it!” But all skaters fall, even the consistent ones. And I like watching her because if she falls, it’s actually a surprise to me. When it’s an inconsistent skater, you’re praying for them to land it clean, and you almost expect them to fall. Anna didn’t have quite the same brilliance…I think she was nervous because last year at NHK she finished 11th and lost the chance to go to the Grand Prix Final. Still, if she can loosen up at the Final, I honestly think she could threaten for a medal. If I was Evgenia Medvedeva, I would look behind me! Nam doesn’t seem to be having so much luck lately. Maybe he’s too busy with Polina :) It’s a pity because he has talent. He’s kind of like Maxim Kovtun that way – lots of potential, but it never gets him anyway. Deniss and Stephane were really cute about the clean skate. When I saw Mikhail’s quad lutz I literally screamed “WHAT?” I think he needs to stay with clean toe loops or salchows for now, use the Jason Brown layout, until he hits those consistently. Then he can build his way up to the full set of quads. Well, Alexei tried but it didn’t quite work out. I think the field is deepening for Europeans – Javier, Russian men’s team (I’m going to be daring and say it will include Mikhail Kolyada and Sergei Voronov), Samohin…Alexei will have to bring his best to compete with all them. Keiji Tanaka was a huge surprise for me, but he skated well. He was like Mariah Bell at Skate America – shining on home ice. I was also happy to see Nathan in a new costume. It’s much better than the plushy pants! The short is nice because it’s not overwhelmed with jumps (although a quad lutz, quad-triple, and triple axel is quite the content!). I think as Nathan grows as a performer, he’ll become a real star, like Javier or Patrick (though I know you will say nobody can be quite like Patrick). I really don’t understand the coaching stuff and I’m not going to try to figure it out. Yuzuru skated very well, but I am not a fan of his. I know that his fans will want to chop off my head for saying this, but to me he doesn’t quite have the skating skills of Patrick. He has good spins and a freaky Ina Bauer, but I think he lacks some of the complete packaging – his skating doesn’t make me want to cry. *closing my eyes and waiting for the Japanese fans to chuck Pooh Bears at my head* And his lavender costume really needs to get burned! I think he will skate well at GPF, but I don’t think he can be too comfortable – it’s a tough field. I’m happy for Adam! I wish Jason was going too, but it’s okay, Adam is really cool and I’m just thrilled that there are two American men in the final! I’m so proud of our boys. I didn’t watch a lot of ice dance. Honestly I do not understand ice dance scoring at all, all the levels and step sequences mean nothing to me :) To me, it’s all about the pretty dresses and the cool lifts. Sinitsina and Katsalapov were a total mess. Their twizzles are just out of control, and ice dancers without good twizzles are like men’s skaters without quads or triple axels. I also love some skaters with problematic elements – if I have to turn a blind eye to when Klimov practically drops his partner on the twist for the hundredth time, I’ll do it. But Sinitsina and Katsalapov just look really hopeless. And I agree, the free dance needs more fire. And why does Victoria’s costume look like it belongs in a steamy movie? I think she needs something more “classic tango”. Hawayek and Baker were a surprise, but they look great. Their dances are classy, and I think in time they will be real contenders. I love all Anna’s dresses too (especially the white one from the short dance last year, it was BEAUTIFUL). I think both Anna/Luca and Kaitlyn/Andrew got robbed of being in the Final. Though I like Hubbell/Donohue, I think they got very lucky to squeeze in, and Bobrova/Soloviev relied on hometown advantage and mistakes from the others. Overall, I think Anna and Luca’s programs are cute and fun to watch, even if they aren’t at the same level as Tessa/Scott or Gabriella/Guillaume. Tessa and Scott’s costumes don’t fit them, Scott DESPERATELY needs a haircut…but they did perform very well in the short dance. To be honest, I’m not a huge Virtue/Moir fan (okay, you can kill me now, clearly I know nothing about skating). I close my eyes as I say this: I could take a nap during their free dance. But the short is nice. I have mixed feelings about them, maybe because I am a huge fan of Kaitlyn/Andrew and the Shibutanis. Please forgive me for my opinions! YES, we have all survived, and now we can take a break…but I have a bad feeling that I’m going to spend two whole weeks fretting over who will win the Grand Prix Final! And I’m sure I will be a mess all the way through the event…my family will have to forgive me for any emotional outbursts! Watching figure skating is literally my life! Hope you and anyone who is reading this has a nice rest before the Final! I think Meagan and Eric just love a good fight. I mean, they like to compete, it motivates them and then you can see a real drive in their skating. Or maybe it was early in the morning, I didn’t look at time shedule, so I don’t know what time they had official practices in Japan. Many things could happened, hope at Worlds we’ll see this great fight berween them, Savchenko-Massot, Stolbova-Klimov and Sui-Han. Maybe, If Sotskova was the same type of skater with Sotnikova, this choreo would suit her better. But they’re so different and have almost opposite types of skating. That’s why her SP doesn’t really work for me. And it’s a pity, because Masha always had one of the most interesting and sophisticated programs among Russian ladies. As for Nam, he’s still young, he’s still growing up, maybe, he hasn’t used to his new height yet. I looked his ISU profile, it says his height 175cm….well it hard to jump with such a long legs. Oh, it seems that Mikhail is planning a quad lutz at Russian Nationals. Yeah about that…men made a breakthrough in tech with all those quads, but at the level of Patrick still skates only Patrick. I mean in terms of skating skills, quality of his steps and edges, transitions. Well, now fans of Gabriella and Guillaume will find and beat me, but I think Anna and Luca deserved to be second at NHK. I’m all for a great fight for pairs. I think if Meagan and Eric don’t have someone to fight, they don’t skate at 100% potential; their best skates always come at major events. Can’t wait for a Worlds battle. I think Maria Sotskova needs a new choreographer. She doesn’t have the big, powerful, dramatic skating like Adelina. She is dainty, young, light on her skates, and she needs a program to emphasize that. Maybe something like Julia Lipnitskaya’s style? Nam might grow into his new legs soon, so I’m keeping my eye on him. The kid has great potential. I just find Yuzuru hard to watch sometimes, probably because I’m devoted to Patrick. It’s like I know Yuzuru is amazing, he can land all these quads, but I’m not having fun watching him. “Nikita Loses Control” – that COULD be a thriller title. Evil Russian agent on a mission back during the Cold War…beautiful blonde partner who could turn against him at any moment…his old partner betrayed him and defected to work with an agent named Ruslan…ha ha ha. I agree that Gabriella and Guillaume didn’t skate well here, and Anna and Luca did. I think the French are often over-scored, even if they have mistakes. Anna and Luca are just really entertaining. I agree with your GP Final predictions! The ONLY thing I can say is that you can never predict ice dance; I was CERTAIN the Shibutanis would win Worlds when they were held in Boston. Then Papadakis and Cizeron pulled off the upset win. The pity thing that before moving to CSKA Sotskova had more unique programs. Maybe she should ask her former choreographer to do programs for her? I’ve never been Yuzuru’s fan. I admire him as a great athlete, who pushed men’s skating to a completely new level and finds motivation and strength to continue doing it. He’s a genious in jumps, talent from nature, he has a character of a champion. All my deepest respect. But his skating doesn’t touch me both emotionally and aesthetically. My only interest in his performances whether he’ll do all his jumps, then his programs make some impression. Otherwise, for me it’s almost nothing to look at. I mean, for example, Jason Brown – even with mistakes on jumps his programs make an impression on me and I still can enjoy his skating. why? I think ice dance is one of the most predictable discipline of figure skating) It gave a lot of opportunities for judging manipulations, because obvious mistakes happens not so frequently. Well, I don’t think that last year Maia and Alex actually had a chance to win, even thou Worlds were in Boston( But two American pairs on podium is also a result. I agree with everything you said! Jason’s free program literally almost got me to tears even though he was doubling everything! I just love EVERYTHING about him. It’s very interesting review!Thank you!I still can’t understand why Tessa and Scott chose to train in group with their bigest rivals.It’s like a challenge for all of them? Maybe they just got used to it?) I mean you see your rivals every day, you know what they’re doing, how their trainings are going, how is their health etc. Total control) You don’t have to wonder what you rivals have prepared, you already knew it all. It’s kind of a perfect strategy when you’re way experienced in such stuff and have a lot of self-confidence. I see. Then it’s very wise move. Thank you cheering me up and making me laugh on a deary post-Thanksgiving Monday in the US, FSGossips. I love the blend of performance analysis, costume/fashion criticism, and witty comments you make. I know there is a lot of conversation about world records, but statistics can be deceiving. With all the changes in requirements and levels in ice dancing, scores don’t mean all that much from season to season. It reminds me of basketball here in the US. Today’s stars are outpacing the records of the great players of the past thanks to the three-point shot, which did not exist when they played. Looking forward to GP final and more of your commentary!